Further details for recommended AF settings. Here are some suggested settings for photographers at the rink or on the slopes. If you find yourself continually switching subjects as the puck passes from one player to another, select low values for Custom Setting a3 (Focus tracking with lock-on) > Blocked shot AF response to quickly refocus at new focus distances. Note, however, that the camera will refocus instantly when the subject leaves the focus point. Choose settings according to whether you are at the side of the hill with jumpers crossing your field of view or at the bottom with jumpers coming toward you. The following settings are recommended for shots taken from the side of the hill. If you find the subject hard to track with 25 focus points, choose a dynamic-area AF mode with 72 or 153 points to increase the supplementary focus coverage available if the subject slips from the selected point. Note that when the subject is at the edge of the frame, the number of focus points available for dynamic-area AF drops; for coverage similar to 25 points, choose 72-point AF. When the subject is at the edge of the frame, the number of focus points available for dynamic-area AF drops; for coverage similar to 25-point AF, choose 72-point AF. Choose settings according to whether the skier is near the gate or taking air over a jump. With a slow blocked-shot response of 5 (Delayed) or 4, the camera may be slow to switch back to the skier after focusing on a gate (the effect varies with the distance between the gate and the skier). If you want to keep the AF‑ON button pressed or the shutter-release button pressed halfway for continuous focus, you can choose 2 or 1 (Quick) for improved focus switching (note that this increases the chance of the camera focusing on the gate). Alternatively, you can choose a slow setting such as 5 (Delayed) or 4 and release the AF‑ON or shutter-release button as needed to refocus after the camera has locked onto a gate. If you anticipate that the subject will come into view suddenly and will not overlap a gate, choose group-area AF. Group-area AF uses a selected group of 5 or more focus points, letting you track your subject in a wide area and ensuring that even small, fast-moving, and hard-to-frame subjects can reliably be captured in sharp focus. Auto-area AF is recommended if composition is a priority. To automatically switch focus points and AF-area modes as you go from “tall” (portrait) to “wide” (landscape) orientation and back again (see this section), select Focus point and AF-area mode for Custom Setting a7 (Store by orientation). For flexible AF-area mode selection when photographing figure skating, select 25- or 72-point dynamic- or auto-area AF with the camera and assign group-area AF to the focus function buttons using Custom Setting f1 (Custom control assignment) > Lens focus function buttons (see this section). You can then press a focus function button to select group-area AF when framing shots of distant subjects with the camera in wide orientation, and release the button to switch to 25- or 72-point dynamic- or auto-area AF when framing shots of nearby subjects in tall orientation. For events in which skaters frequently cross in front of one another, a slow blocked-shot response is recommended to improve tracking and prevent the focus point falling between the skaters. Use group-area AF if the subjects are far away. 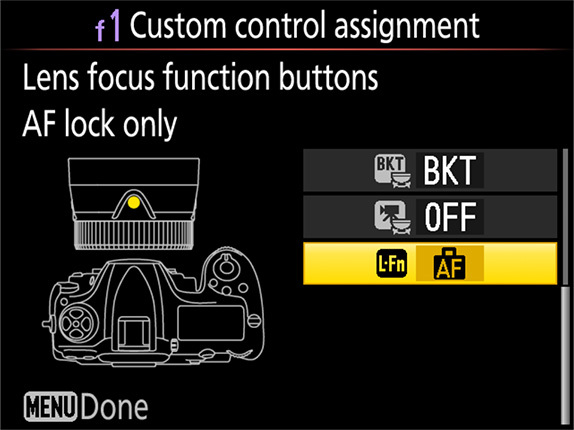 For flexible AF-area mode selection, select auto-area AF with the camera and assign group-area AF to the focus function buttons using Custom Setting f1 (Custom control assignment) > Lens focus function buttons (see this section). You can then press a focus function button to select group-area AF for distant subjects and release the button to switch to auto-area AF when your subjects are closer. For more precise focus, use 25-point dynamic-area AF for wide-orientation upper-body shots and shots taken head-on. Switch to 72 points for tall-orientation shots with the skater near the edge of the frame. Group-area AF is a good choice when your subject is in the lead, but it may continue to focus on the leader even when your subject is back in the pack. For rapid AF-area mode selection when skaters switch positions, assign AF-area mode to the lens focus function buttons using Custom Setting f1 (Custom control assignment) > Lens focus function buttons (see this section). Try these settings for gymnastics events. Auto-area AF is recommended if composition is a priority, but dynamic-area AF may be preferred if the background contains objects with regular, detailed patterns, as otherwise photos may not be in focus even if the in-focus indicator ( ) is lit. If you are using dynamic-area AF, choose an option with a comparatively high number of focus points ( ) to capture fast-moving subjects. Select Focus point and AF-area mode for Custom Setting a7 (Store by orientation) to automatically switch focus points and AF-area modes as you rotate the camera (see this section). If you find yourself frequently changing focus points, choose 15 points for Custom Setting a6 (Number of focus points) to reduce the number of focus points for quicker selection (see this section). For events with apparatuses, choose 3D-tracking, position the focus area over your subject (for best results, choose the uniform or another area of the subject that is a different color from the background), and press and hold the AF‑ON button or keep the shutter-release button pressed halfway. The camera will automatically track the subject, letting you concentrate on composition. If you find that the camera has trouble tracking athletes against the stands, billboards, and other varied backgrounds, switch to 25- or 72-point dynamic-area AF. Select Focus point and AF-area mode for Custom Setting a7 (Store by orientation) to automatically switch focus points and AF-area modes as you rotate the camera (see this section). If you find yourself frequently changing focus points when using dynamic-area AF, choose 15 points for Custom Setting a6 (Number of focus points) to reduce the number of focus points for quicker selection (see this section). Auto-area AF is recommended if composition is a priority, while 25-point dynamic-area AF is suggested for close-ups. When photographing events with frequent jumps or changes of direction, choose 3D-tracking, position the focus area over your subject (for best results, choose the uniform or another area of the subject that is a different color from the background), and press and hold the AF‑ON button or keep the shutter-release button pressed halfway. The camera will automatically track the subject, letting you concentrate on composition. If you find that the camera has trouble tracking athletes against the stands, billboards, and other varied backgrounds, switch to 25- or 72-point dynamic-area AF. If you find the subject hard to frame, choose a dynamic-area AF mode with more focus points ( ) or select auto-area AF. Auto-area AF in particular lets you concentrate on composition while leaving the camera in charge of choosing the focus point. If you can’t see athletes on their approach, focus on the vault and then refocus when a vaulter comes into view. If you find the subject hard to track using 25-point dynamic-area AF, choose a mode with more focus points ( ). You may find these settings useful when photographing road running or track and field events. Choose 25-point dynamic-area AF when photographing approaching runners to help prevent the camera focusing on their hands, group-area AF for more reliable focus when photographing runners on the start line and in other shots taken at long range. Select Focus point and AF-area mode for Custom Setting a7 (Store by orientation) to automatically switch focus points and AF-area modes as you rotate the camera between “tall” (portrait) orientations and “wide” (landscape) orientation for shots taken after the runner has crossed the finish line (see this section). For flexible AF-area mode selection when photographing approaching runners, select 25-point dynamic-area AF with the camera and assign group-area AF to the focus function buttons using Custom Setting f1 (Custom control assignment) > Lens focus function buttons (see this section). You can then press a focus function button to select group-area AF when your subject is far away and release the button as the runners approach to instantly switch to 25-point dynamic-area AF without taking your eye from the viewfinder. Choosing an AF-area mode with comparatively few focus points (single-point or 25-point dynamic-area AF) helps prevent the camera focusing on the hurdles or the hurdler's legs. You can refocus as needed if the camera focuses on the hurdles in the foreground. Select Focus point and AF-area mode for Custom Setting a7 (Store by orientation) to automatically switch focus points and AF-area modes as you rotate the camera between “tall” (portrait) orientations and “wide” (landscape) orientation for shots taken after the hurdler has crossed the finish line (see this section). Choosing 25-point dynamic-area AF or single-point AF makes it easy to keep subjects in focus as they change position in the pack, but you could instead choose auto-area AF if you find it hard to keep your subject in the focus point when shooting from a moving vehicle. If your lens supports vibration reduction, choose SPORT (if available) or ACTIVE to reduce camera blur. SPORT also stabilizes the image in the viewfinder. Choose group-area AF for more reliable focus when photographing these events from the front at long ranges. Choosing a dynamic-area AF mode with comparatively few focus points ( ) when photographing long and triple jumps from the front helps prevent the camera focusing on the sand while still letting you capture subject motion. If you find it difficult to keep the subject in the frame, choose a dynamic-area AF mode with more focus points ( ) or select auto-area AF. Choosing single-point AF helps prevent the camera focusing on splashes (you can refocus as needed if the camera fails to focus on the main subject). For flexible AF-area mode selection when photographing the start of a race, select single-point AF with the camera and assign group-area AF to the focus function buttons using Custom Setting f1(Custom control assignment) > Lens focus function buttons (see this section). You can then press a focus function button to select group-area AF when your subject is diving from the starting block and release the button once the swimmer is in the water to instantly switch to single-point AF without taking your eye from the viewfinder. AF-area mode can also be assigned to the Pv, Fn1, Fn2, or AF-ON button, to the center of the sub-selector, or to the AF-ON button on the optional MB-D17 battery pack (see this section). When photographing divers against low-contrast, undifferentiated backgrounds, choose 3D-tracking, position the focus area over your subject (for best results, choose the uniform or another area of the subject that is a different color from the background), and press and hold the AF‑ON button or keep the shutter-release button pressed halfway. The camera will automatically track the diver, letting you concentrate on composition. When photographing divers against the stands, billboards, and other high-contrast backgrounds, select 72-point dynamic-area AF.